Sant Jnaneshwar was born over seven hundred years ago in the village of Alandi, on the banks of the Indrayani river. The son of a sannyasi, he was shunned by the local Brahmins. It is said that Jnaneshwar won the right to investiture with the sacred thread by making a water buffalo recite the Vedas. At the age of twenty-one, Jnaneshwar spontaneously dictated the Bhavartha Dipika, the first ever vernacular commentary on the Bhagavad Gita. This scintillating feat, uniting the Yogas of Devotion and Knowledge, earned the young Sant enduring fame. He is widely revered as an incarnation of Krishna. At the age of twenty-two, he was entombed in a state of deep meditation known as jivan samadhi. Centuries later, Sant Eknath entered the tomb and saw a radiant youth seated in meditation. 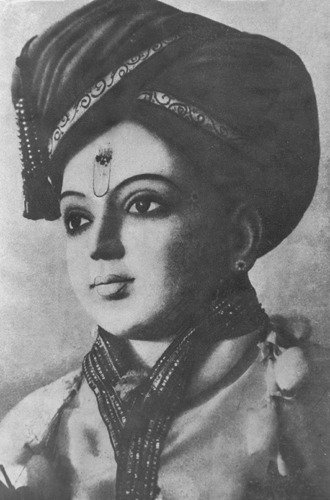 Jnaneshwar is still believed to be alive, anchoring his light body as a crystal of enlightened energy radiating from Alandi to the entire world.